Patrick Thirkell believes people are trying to force him to sell the Old Mills. Fire officers have launched an investigation after an 11th-century cabin was engulfed in “roaring” flames in early yesterday morning. Last night Patrick Thirkell, who owns the Old Mills in Elgin, said he believed it had been set deliberately. Moray Council recently cleared rubbish and a static caravan from the Old Mills after repeated attempts to get Mr Thirkell to do it himself did not work. It was the third time the authority has been forced to take direct action to clear the land following enforcement action. 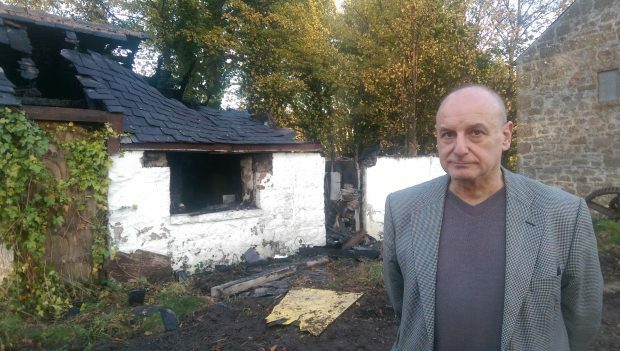 Mr Thirkell, who described himself as “devastated” about the fire, believes removing the caravan from the land paved the way for vandals to strike. The former RAF man said: “There’s no security here now. I had someone living in the caravan here to stop things like this from happening. It’s happened before and it’s happened again. Mr Thirkell, who lives in Hopeman, said he now intends to move a caravan to the riverside spot to sleep in overnight to guard the remaining buildings there. Yesterday, smoke continued to billow through the trees after the flames burst through the slate roof of the former toilet block. It is understood the building was initially used as a mill and can trace its origins back to 1010. The structure is now the second on the site to be reduced to a ruin after another mill was destroyed by fire nearly four years ago. Two years earlier a double-decker bus that was kept there at the time was also engulfed in flames. Nearby resident Jo Stewart, whose home overlooks the mills, raised the alarm just before midnight on Wednesday. Firefighters battled for more than two hours with five jets of water to stop the flames spreading to nearby trees. Mrs Stewart said: “It was absolutely roaring. It was really quite serious. “The residents here are really quite nervous about these attacks now, especially with all the trees here. It’s very worrying. Yesterday police confirmed they were assisting the fire service in an investigation on the site.